"The Boulevard Montmartre at Night" was an oil painting painted by Camille Pissarro in 1897. "The Boulevard Montmartre at Night" provides a snapshot into the world of the French impressionist painters. In the 19th century Montmartre was the artistic hub of Paris and it still is today. 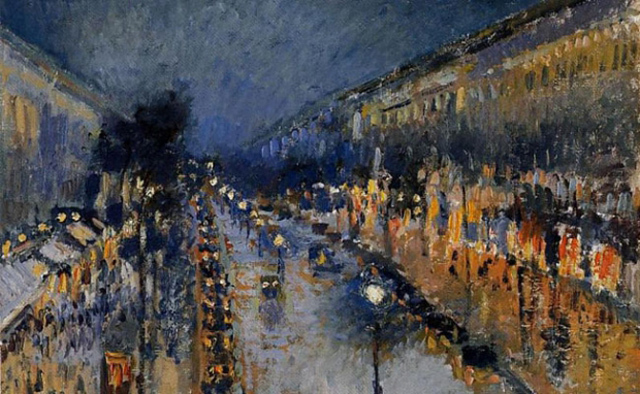 Camille Pissarro combined an incredible blue-black sky, beautifully lined buildings vanishing into a point far off, and a road lit by street lights to create this Impressionist masterpiece. It's the only night scene painting from this series, and is a masterful rendition of the play of lights on dark and wet streets. Camille Pissarro neither signed nor exhibited it during his lifetime. If you stroll down the streets of Montmartre today you will probably be stopped by artists offering to draw your portrait for a fee. You can imagine Camille Picasso drinking absinthe with Matisse at a bohemian cafe, or Camille Picasso admiring Edgar Degas’ paintings at his studio. He was a cool character and remained friends with many of the more temperamental Impressionists, such as Gauguin, Picasso, and Cezanne. Camille Pissarro was a Danish-French Impressionist and Neo-Impressionist painter born on the island of St Thomas. His importance resides in his contributions to both Impressionism and Post-Impressionism. Camille Pissarro studied from great forerunners, including Gustave Courbet and Jean-Baptiste-Camille Corot. Pissarro later studied and worked alongside Georges Seurat and Paul Signac when he took on the Neo-Impressionist style at the age of 54. In 1873, Pissarro helped establish a collective society of fifteen aspiring artists, becoming the "pivotal" figure in holding the group together and encouraging the other members. Art historian John Rewald called Pissarro the "dean of the Impressionist painters", not only because he was the oldest of the group, but also "by virtue of his wisdom and his balanced, kind, and warmhearted personality". Cézanne said "Pissarro was a father for me. A man to consult and a little like the good Lord," and he was also one of Gauguin's masters. Renoir referred to his work as "revolutionary", through his artistic portrayals of the "common man", as he insisted on painting individuals in natural settings without "artifice or grandeur". Camille Pissarro is the only painting artist to have shown his artwork at all eight Paris Impressionist exhibitions, from 1874 to 1886. Pissarro "acted as a father figure not only to the Impressionists" but to all four of the major Post-Impressionists, including Georges Seurat, Paul Cézanne, Vincent van Gogh and Paul Gauguin. Reproduced by our local talented and experienced painting artists who have been painting for more than 30 years in real museum quality standard. If the clients are not satisfactory with our quality after receiving paintings, we promise to refund the payment by 100%. Tags: The Boulevard Montmartre at Night Painted By Camille Pissarro in 1897, Camille Pissarro Paintings.